Together, the clinically effective dosages of UC-II Type-II collagen, boswellia serrata, grape seed extract, curcumin, and black pepper extract alleviate joint pain, inflammation, and swelling, and help keep your cartilage healthy, strong, and intact. All that is why FORTIFY has over 210 reviews from customers on Amazon.com with a 4.5-star average, and another 120+ on our websites, also with a 4.5-star average. 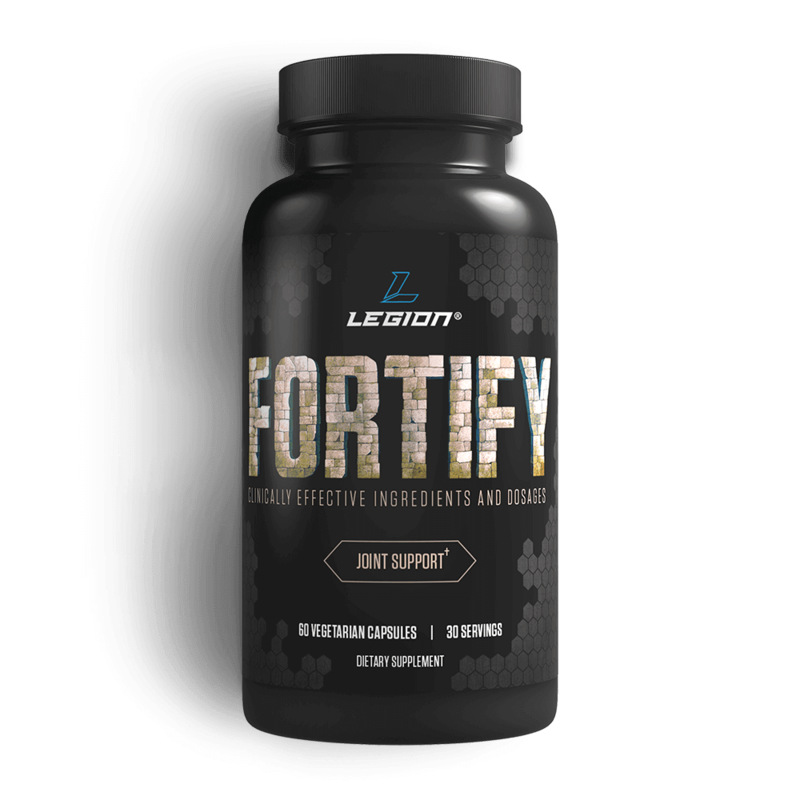 What FORTIFY is not, though, is cheap, so if you’re concerned about the price, I understand--you can get a joint supplement for a bit less. Remember that you get what you pay for, though, so generally speaking, the cheaper a supplement is, the less effective the formulation. Place your order now and if you don’t absolutely love FORTIFY, just let us know and we’ll give you a full refund on the spot. No complicated forms and no return necessary. You really can’t lose, so order now and get ready to enjoy healthier and more functional and pain-free joints that can withstand the demands of your active lifestyle. Collagen is the main protein of the various connective tissues in animals and type II collagen (CII) is a type of collagen that makes up your joint cartilage. “Undenatured” is more than a fancy word—it’s vitally important to the effectiveness of the product. Denaturization is the alteration of the natural structure of a substance, usually by the addition of another chemical or heat that changes the substance’s physical properties. We chose the lower end of the clinically effective dosage because it isn’t clear if more is better. Research clearly shows that 10 mg is effective but not that two, three, or four times that amount is more so. Curcumin is the yellow pigment found in the turmeric plant, which is the main spice in curry. It has been used therapeutically in Ayurvedic medicine for thousands of years. Fortunately, there’s an easy solution for increasing bioavailability—black pepper extract. Research shows that pairing black pepper extract with curcumin increases bioavailability twentyfold. And when you do that, curcumin becomes an effective joint support supplement. When paired with black pepper extract, the clinically effective dosages of curcumin range between 500 and 1000 milligrams. Thanks to modern science, we now know why. And in case you’re wondering, the difference between the anti-inflammatory mechanisms of curcumin and boswellic acids is they work on different enzymes. Curcumin inhibits an enzyme known as cyclooxygenase, or COX, and boswellic acids inbhibit lysyl oxidase, or LOX (and, most notably, 5-LOX). The clinically effective dosages of boswellia serrata range between 100 and 200 milligrams. There are two molecules in grape seed extract that account for most of its health benefits: tannins, which are bitter compounds that make wine taste dry, and procyanidins, which are chains of antioxidants found in some plants. Much of the research on grape seed extract’s beneficial effects on joint health is extrapolated from research on a similar molecule known as pycnogenol, which is also a potent source of procyanidins. Pycnogenol is significantly more expensive than grape seed extract, however, which is why GSE is preferable for supplementation needs. Take 2 capsules daily, with or without meals. For optimal results, take first thing in the morning. Not intended for persons under the age of 18. Do not use if pregnant or nursing. Consult a health care professional prior to consumption if you have any pre-existing medical conditions or are taking any prescription medication. Improper use of this product will not improve results and is potentially hazardous to a person's health. Use only as directed. 02. The effects of exercise on human articular cartilage. 03. Long distance running and knee osteoarthritis. A prospective study. 04. Effects of orally administered undenatured type II collagen against arthritic inflammatory diseases: a mechanistic exploration. 06. Suppression of type II collagen-induced arthritis by intragastric administration of soluble type II collagen. 09. Curcumin: the Indian solid gold. 10. Curcumin (diferuloylmethane) down-regulates expression of cell proliferation and antiapoptotic and metastatic gene products through suppression of IkappaBalpha kinase and Akt activation. 11. Bioavailability of curcumin: problems and promises. 12. Consumption of the putative chemopreventive agent curcumin by cancer patients: assessment of curcumin levels in the colorectum and their pharmacodynamic consequences. 13. Influence of piperine on the pharmacokinetics of curcumin in animals and human volunteers. 14. The antioxidants curcumin and quercetin inhibit inflammatory processes associated with arthritis. 15. Boswellia serrata, a potential antiinflammatory agent: an overview. 16. Acetyl-11-keto-beta-boswellic acid (AKBA): structure requirements for binding and 5-lipoxygenase inhibitory activity. 17. Efficacy and tolerability of Boswellia serrata extract in treatment of osteoarthritis of knee--a randomized double blind placebo controlled trial. 18. Role of oxidative stress in cytotoxicity of grape seed extract in human bladder cancer cells. 19. Protective effect of grape seed extract against oxidative stress-induced cell death in a staurosporine-differentiated retinal ganglion cell line. 20. The polyphenol-rich extract from grape seeds inhibits platelet signaling pathways triggered by both proteolytic and non-proteolytic agonists. 21. Postprandial blood glucose response to grape seed extract in healthy participants: A pilot study. 22. Proanthocyanidin-rich grape seed extract reduces leg swelling in healthy women during prolonged sitting. 23. Grape seed extract suppresses MDA-MB231 breast cancer cell migration and invasion.